The move in a key Senate race comes as the Koch network is seeking distance from President Trump's GOP. COLORADO SPRINGS, Colo. — The primary political arm of the conservative Koch network announced at a semiannual donor conference here Monday that the organization will not support North Dakota Republican Senate candidate Kevin Cramer this fall, saying that his record on issues like the farm bill, corporate welfare and government spending run counter to the network’s positions. 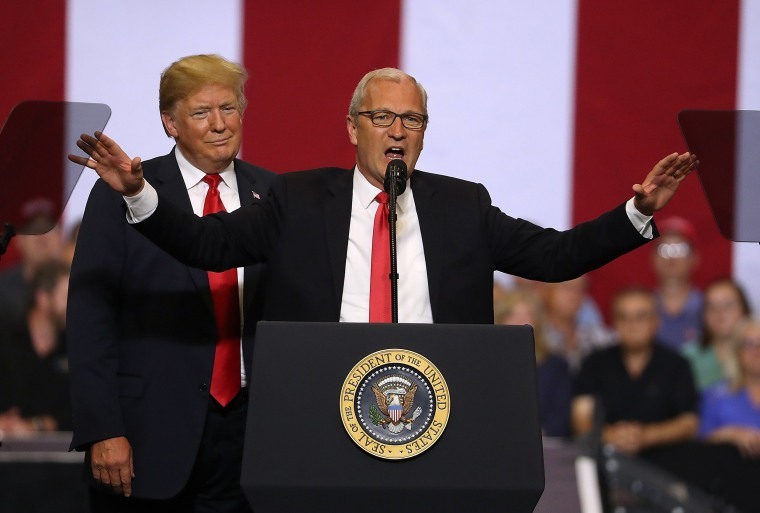 Cramer is trying to unseat Democratic Sen. Heidi Heitkamp in one of the Republican Party’s prime opportunities to pick up seats to protect its Senate majority this fall. In a statement, Cramer said, "I respect the decision by the Koch Network to not engage in the North Dakota Senate race. As I have always said, I work for the people of North Dakota and will always vote with them in mind." Americans for Prosperity thanked Heitkamp in a digital ad last month for supporting a rollback of regulations in the Dodd-Frank banking bill. Responding to the move, Heitkamp spokesperson Julia Krieger said that “when it comes leading on the pocketbook issues North Dakotans care about — from strong trade markets to responsible spending and cutting red tape for North Dakota businesses — Heidi has always been consistent: North Dakota comes first." The Koch organization, which expects to spend $300-$400 million on politics and policy priorities in the 2018 cycle, announced this weekend that it will no longer blindly support Republicans. Cramer is not the only Republican candidate that the Koch network has yet to endorse. Of the 10 GOP-leaning states Democrats must defend, the organization has only engaged in four: Wisconsin, Missouri, Florida and Tennessee. Missing from the list are Indiana, Montana, West Virginia, Ohio and Pennsylvania. Also not on the list, 99 days before the elections, is Nevada where Republican Sen. Dean Heller is trying to keep his seat in a state that Hillary Clinton won. The organization's patron, Charles Koch, told reporters Sunday that he “regrets” supporting some Republicans in the past who have not followed through on stated policy positions, adding that he would be willing to support Democrats if they fall in line with the Koch mission of a smaller government with fewer regulations. They are particularly focused on candidates’ votes and positions on trade, immigration, spending and criminal justice reform.